This weekend, as cool October breezes foreshadow winter in the northern hemisphere, Nuit Blanche lights up the night in Paris, illuminating the City of Light with dazzling displays of neon and avant garde art installations. French for White Night, Nuit Blanche is an annual nocturnal arts festival, featuring all manner of living art installations and immersive environments. Art galleries, museums and other cultural establishments stay open to the public all night, free of charge, while the heart of the city is transformed into a living art gallery with live music, film, dance and performance art, throughout the night. This vision for a night-time festival of the arts has spread across the globe, inspiring Nuit Blanche events in over 120 cities. From Sydney to Taipei, Montreal to Rome, Nuit Blache events have ignited an international fellowship of passion for the arts and cultural expression. Participating cities share their experiences and exchange projects and artists. Each year, new cities become candidates. 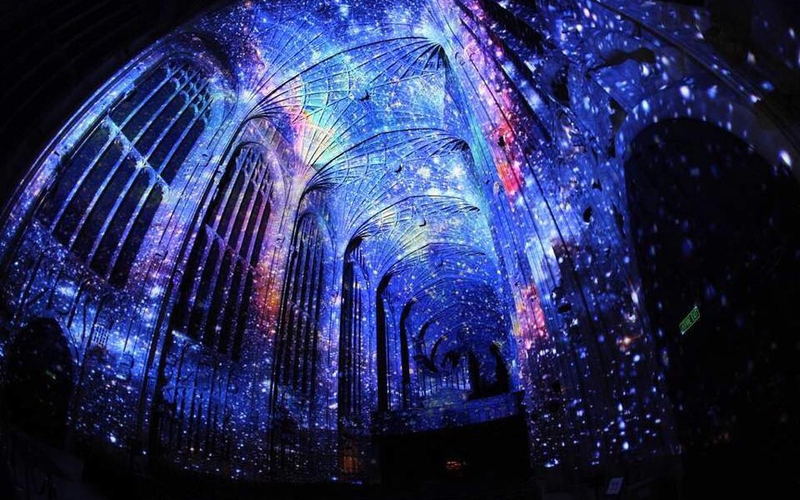 Digital artist Miguel Chevalier has transformed the ceiling of the Saint-Eustache Church into a dynamic, imaginary sky chart for the 2016 Nuit Blanche Festival in Paris. 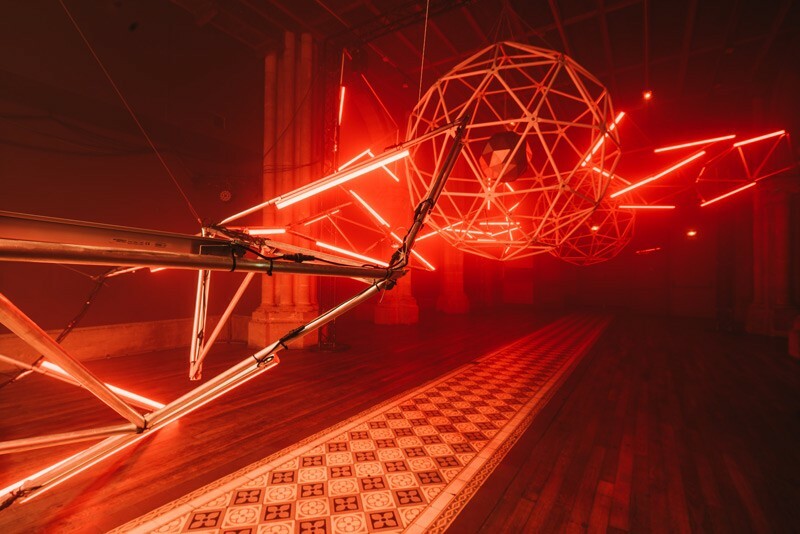 The installation, titled Voûtes Célestes, illuminates the soaring ceilings with 35 different colored networks to create glowing webs of light that highlight the church’s gothic architecture. It is no surprise these phosphorescent wonderlands attract attendees in the hundreds of thousands. In our visual world, even a single installation has the power to imprint memories with powerful effect. The marriage of glowing colors with striking geometric shapes and the exuberant din of street party reveling ignites the senses, immersing festival goers in an effervescent world of lasers, colored lights and projections. Minds are open to the sights, sounds and messages careening through the sparkling night! Brands and event planners can harness this power to great effect. 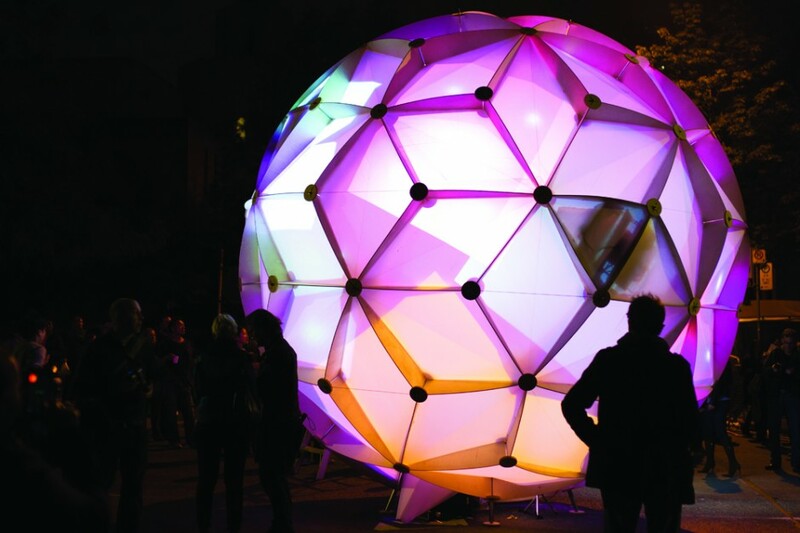 No matter the scope of your project, you can incorporate a geodesic dome and event lighting to create a fantastical art world that comes alive in the darkness. 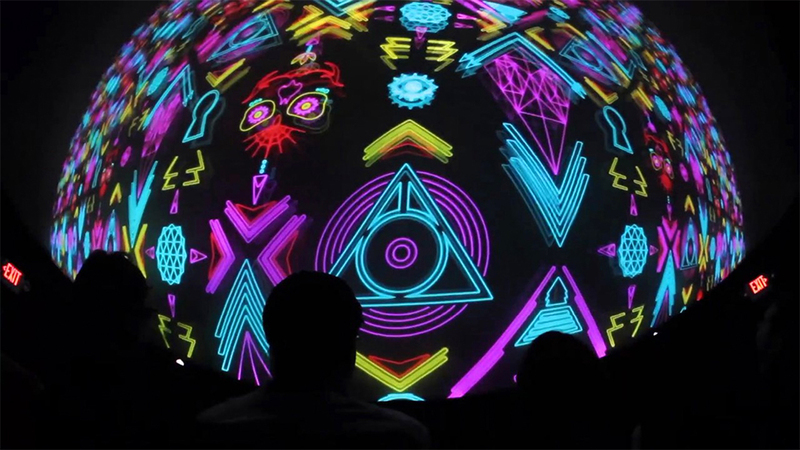 From a single cover-less geodesic dome structure poised under lights, to a glowing event dome with a branded cover lit from the inside by colorful projections, to an epic world-class virtual reality theater dome with a blackout liner and projection mapping technology, immersive environments are easily scaled to the size of your project. A stunning geodesic dome can serve as the heart of your night-time event, no matter the scale. On the high end, a large dome can dominate the landscape, employing projection mapping to create a virtual reality world within. A blackout projection liner creates the perfect theatrical backdrop for immersing those within the dome. There, against the inner curvature of the polyhedron, the projections of your custom dreamworld play out in vivid color. Outside, additional projection mapping technology brings scenes of colorful dreamscapes to life on the dome cover. For mid range projects, domes can be lit from within and feature projections shining through EventLite fabric so they are visible from both inside and outside. These domes are frequently utilized for lounges and bars, aerialist performances, and neon wonderlands. 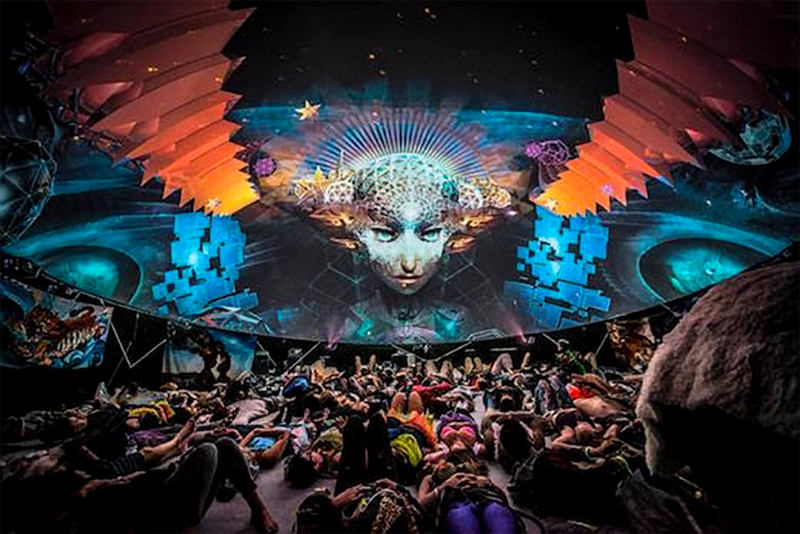 Domes can be installed as frames only, their steel struts shining under colored lights, creating ideal photo-ops as festival-goers become part of the living art-scape. Merging modernist design principles with the timeless magic of sacred geometry, geodesic domes are an optimal solution for party planners looking to create unforgettable immersive environments. Domes can feature thought-provoking displays of lights and art. They make unforgettable dance floors, art installations, performance venues and gathering spaces. For Nuit Blanche, years of work and countless hours go into building each project. 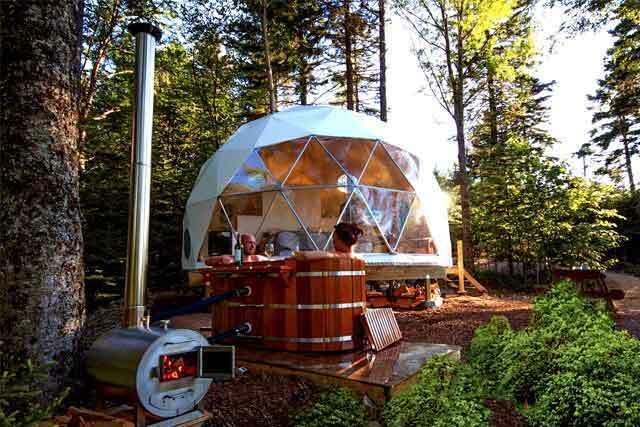 But a geodesic dome can be installed in as little as a day, and a variety of interior liners and projection solutions are available, scaled to the scope of your project and budget. 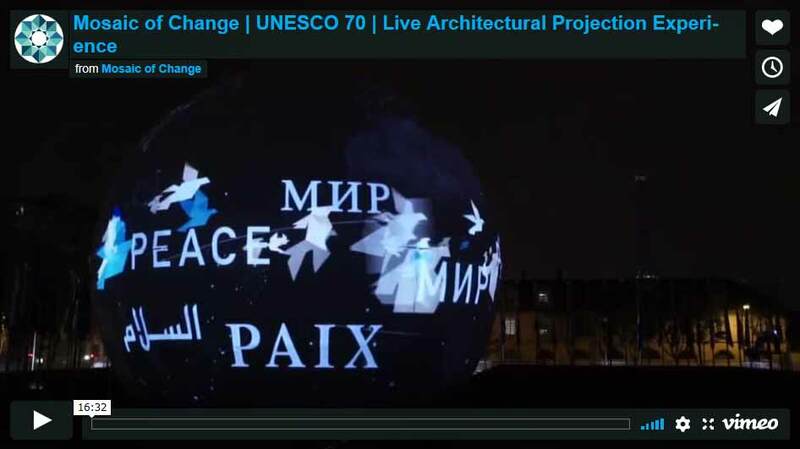 Pacific Domes, the worldwide leader in Event and Projection Domes, partners with Obscura Digital to deliver world class projection mapping technology and stunning illuminated schemes, as seen in “Mosaic of Change,” the UNESCO projection for Peace and the projections on the United Nations building in Paris. Contact Pacific Domes for your turnkey solution to create an unforgettable immersive event, like Nuit Blanche!